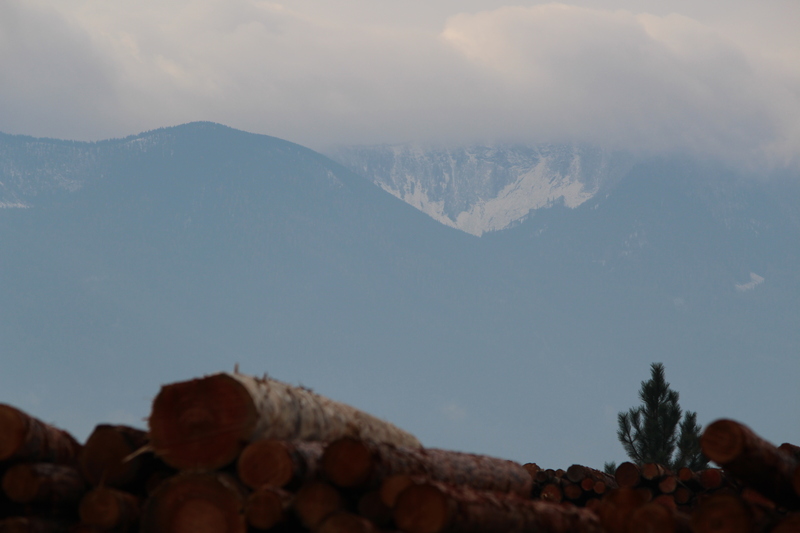 Little town, big logs: Moyie Springs, Idaho | Oh, the Places We See . . . Sometimes I buy postcards to send to friends and relatives, write them in the car while my husband drives, and then search for the nearest post office so that folks get correspondence stamped from the state I’m visiting. And that’s what happened as we were in way northern Idaho almost to Canada. Bert, I said, pull over here! 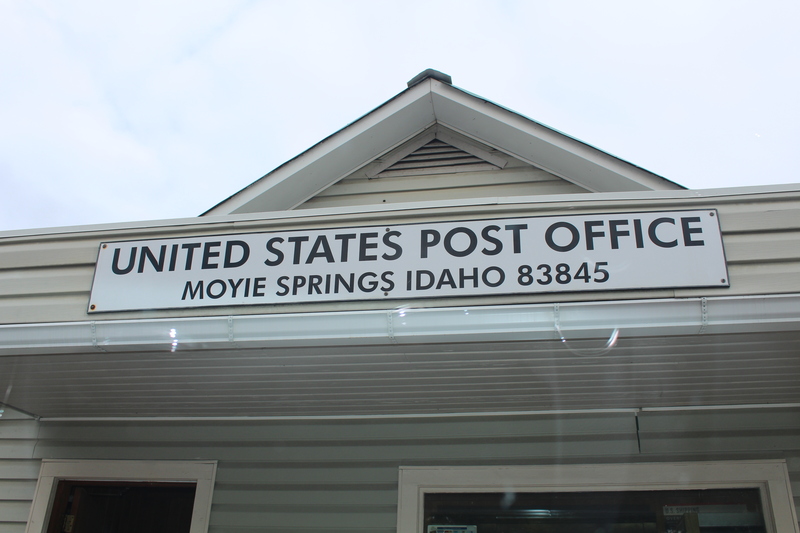 We found ourselves in Moyie Springs, Idaho, in the post office mailing cards. But when we came out, we saw logs. Huge logs. Stacks and stacks of logs. Now, for those of you who live in Idaho, you probably don’t even see logs since they’re part of your everyday experience. Kind of like not seeing wheat fields or potato farms or screaming tall evergreens. But to two folks from Tennessee, this was picturesque. One of the major industries of Idaho right here near the Moyie Springs PO! And the best surprise came when I got up close to take the picture and noticed what was looming on the horizon. So, chalk up another tiny experience that gave us pause. And much pleasure. If you live or travel through Moyie Springs, Idaho, enjoy the scenery. It’s what we’ve come to love about the Inland Northwest. For more posts on the Inland Northwest, click on the page at the top of this blog. And leave us a comment, especially if you’ve been there and loved it, too! This entry was posted in Idaho, Travel and tagged Idaho, logs, Moyie Springs, travel. Bookmark the permalink. I live just down the street from that mill. I love to fly my quad copter with a go-pro attached into the mill yard. If you want to see my video, just look up “Millions of Dead Trees” on YouTube! You will see what I mean! Thanks for leaving us this note. We loved that town so much — and the logging industry is fascinating. Thanks for directing us to your video. I fight the urge to paint a smiley face on just one of them. #IsThatWrong? That would be soooo fun! 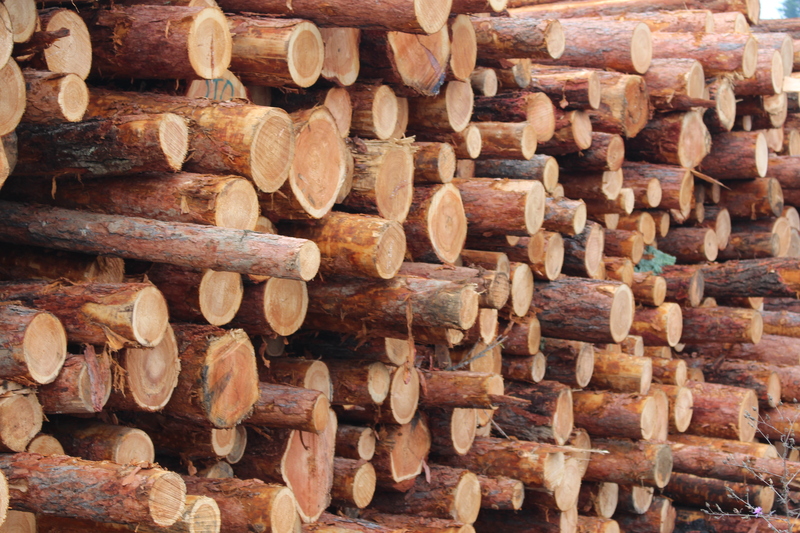 Best thing about the stacks of logs is the smell of fresh wood. You are so right. 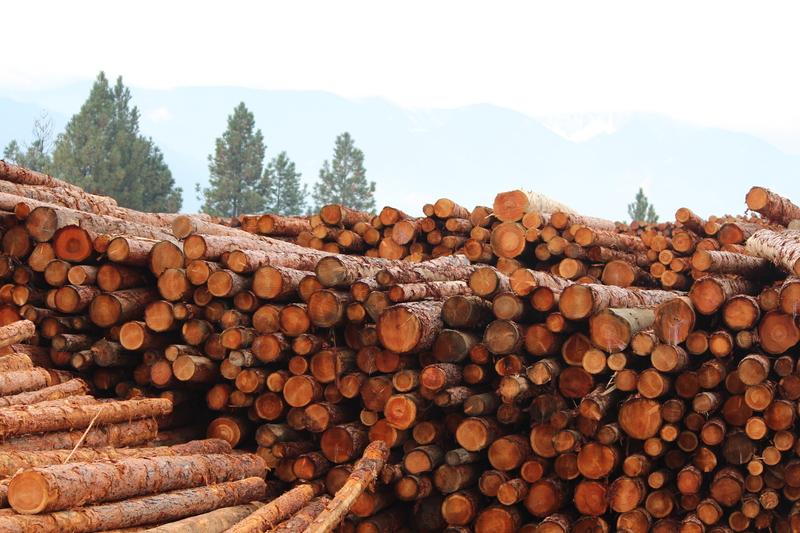 We saw umpteen logging trucks and even more stacks of logs throughout the area. What a great state!